It is no secret that I'm a lady who likes the finer things in life, so the thought of being marooned is not a happy one for me at all. Today our salon guest is a man who spent four years alone after refusing to sail on a ship that he considered unsafe. His story inspired Robinson Crusoe and he has become famous for his experiences on the island that became his temporary, lonely home. In September 1704, Alexander Selkirk found himself as sailing master aboard the Cinque Ports under Captain Thomas Stradling, the ship laying at anchor at an island named Isla Más a Tierra, 420 miles off the coast of Chile. Concerned for the state of the ship, Selkirk informed the captain that the vessel was no longer seaworthy and that, if repairs were not made, he would rather not sail on at all. Stradling readily agreed that Selkirk would ne better off left behind and when Selkirk changed his mind, the captain told him it was too late, he would have to make the best of his new situation as sole resident of Isla Más a Tierra. In fact, Selkirk was right and the ship did indeed founder, with all survivors taken to Lima by the Spanish, where they were held in prison. Although their time in captivity was far from easy, for the man left marooned, life was not much happier at first. With no sign of rescue, Selkirk tried to adjust to his new, lonely life on Isla Más a Tierra. At first he kept to the shoreline but when the noise of mating sea lions became too much, he was forced inland and things began to change. Here found an alternative to the seafood that he had survived on, dining now on goat and fresh vegetables and using tamed feral cats to chase off the rats that plagued his nights. Believing that there was no hope of rescue he began to learn the ways of the land, building huts for sleeping and cooking, making tools and knives and even taking care of his own health after a serious fall. He used goatskins for clothing and contented himself with singing and reading from the bible until the day that sailors arrived on the island. However, hopes of salvation were crushed by the realisation that the men were Spanish. 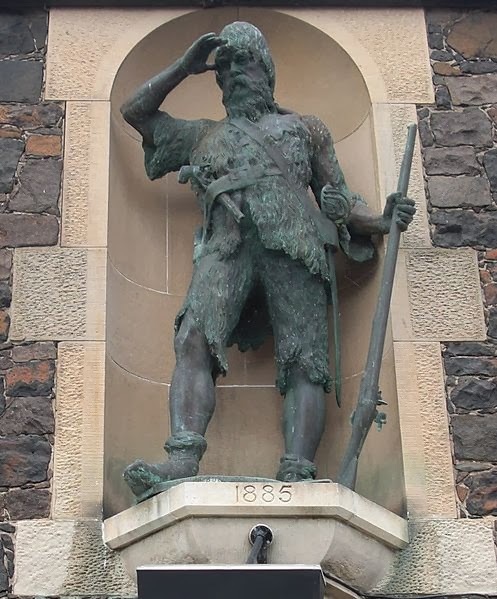 Knowing full well that his fate would be grim if captured, Selkirk fled the pursuing sailors and evaded capture. On 2nd February 1709, almost five years after Selkirk watched the Cinque Ports sail away, two ships, the Duke and the Duchess sailed alongside the island and crewman Thomas Dover led a landing party ashore. The overjoyed Selkirk welcomed them with open arms and by way of thanks captured wild goats on which the scurvy-ridden crews were able to feast. Selkirk was made second mate of the Duke and impressed the men with his vigour and positive outlook. Happily ensconced aboard the vessel he looked to the future and enjoyed many adventures before his return to England on 1st October 1711, where he became famed for the story of his life on the island. Very interesting! What an experience. Indeed and I think I would rather have been marooned than a prisoner of the Spanish! Great story - no wonder Defoe was inspired by it! I know; what a life!